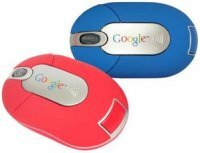 The Google Recycled Mini Wireless Mouse is definitely one of the cuter peripherals I have come across, and it adds to the ‘fun’ feeling that the company offers even while at work. This diminutive piece of hardware comes with a Wi-Fi dongle stored on it, and has an 800 dpi resolution while being made out of recycled plastic. It will come in blue or red colors, and the $19.20 mouse even ships in recycled packaging to keep those green advocates quiet. Perfect in keeping in line with the company’s “Do no evil” mantra.